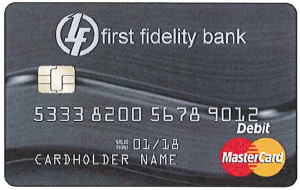 First Fidelity Bank Debit card allows you to buy products and services without writing a check and is accepted anywhere you see the MasterCard logo. Use your debit card for FREE at a First Fidelity Bank ATM. You can use your debit card surcharge free at ATMs that participate in the Accel program. Use the Accel locator to find a surcharge free ATM. You can also use your First Fidelity Bank Debit Card at any Automated Teller Machine displaying the Mastercard® logo to make cash withdrawals from checking, transfer funds between savings and checking, or make balance inquiries on either account.